Food blogger Siddhi Panchal shares her Diwali recipes. You can share yours too! Heat a pan, and empty condensed milk can into it. Now add a half bowl of desiccated coconut into the condensed milk and after mixing well add the other half. Stirring continuously cook for not more than two minutes. Once the mixture is ready, take it out in 5 different bowls equally. In the first bowl add Nutella for the chocolate flavor, coffee in the next bowl. Now add rose syrup, cardamom powder and lastly orange syrup in different bowls respectively. Blend the mixture and flavors in the bowls. Place a serving plate and a small bowl filled with desiccated coconut. 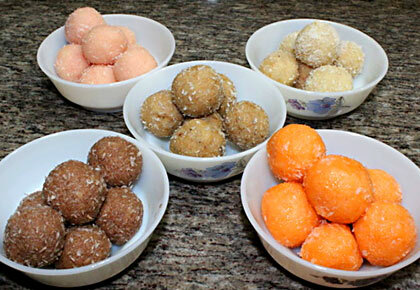 Prepare small balls (laddoos) by taking the mixture from one flavor. Once you roll out a smooth ball dust lightly with desiccated coconut and place in a serving bowl. 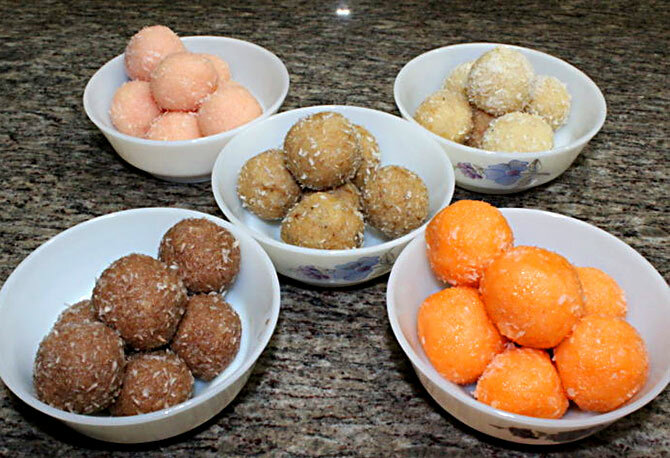 Similarly, prepare laddoos from all the flavors and dust it with a little amount of desiccated coconut. Dear readers, you can send us your favourite recipes too. Write in to us at getahead@rediff.co.in (subject: Diwali Recipes) with your NAME, HOMETOWN and any interesting details about the origin of the recipe, along with a photograph of the recipe if possible. We'll publish the best ones right here on Rediff.com. Have you tasted these ancient Indian curries?